Naturally, not everyone needs a boat this large, but Roadmaster ranks as one of the better examples of this now-extinct breed. A famous old name, last used in 1958, graced the latest full-size, rear-drive Buick, offered first as an Estate wagon. 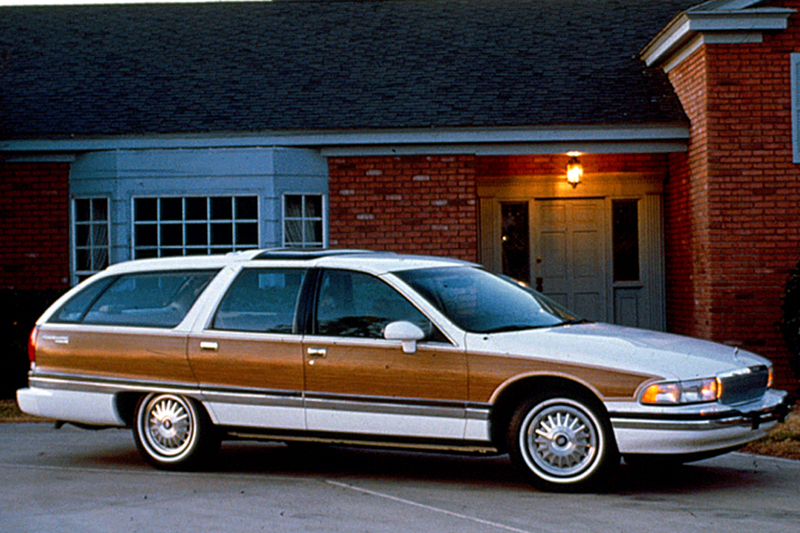 Fully restyled with a rounded aero look, Roadmaster used the same chassis and mechanicals as the Chevrolet Caprice and Oldsmobile Custom Cruiser wagon–both redesigned for ’91. 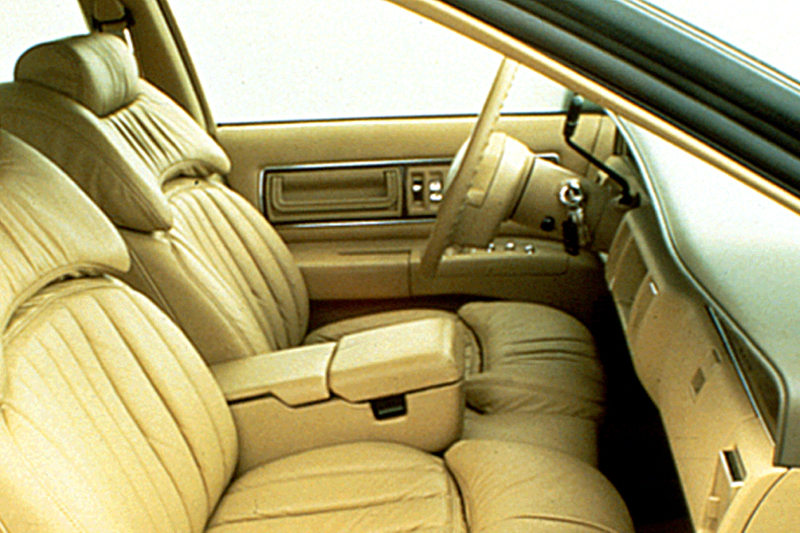 A driver-side airbag was mounted in a standard tilt steering wheel. Antilock braking was standard. Only one powertrain was available: a 170-horsepower, 5.0-liter V8 driving a 4-speed automatic transmission. Wagons had woodgrain siding and two or three rows of seats, for up to 8-passenger capacity. A fixed-glass “vista roof” sat above the middle bench, while a 2-way tailgate swung open to the left. Center and rear seats fold to create a flat cargo area, which can hold a 4×8 sheet of plywood. A 4-door sedan joined the Roadmaster wagon as an early ’92 model, carrying a 5.7-liter V8 engine that developed 180 horsepower. That engine also went into the Estate Wagon, displacing the original 5.0-liter. Dual airbags were installed, but even bigger news went under the hood. Roadmaster buyers got a modified version of the LT1 engine used in Chevrolet Corvettes. Similar in displacement to the prior V8, the LT1 sent 260 horsepower to a new 4-speed automatic transmission. A redesigned dash held new gauges, with climate controls higher and a knee bolster below. Only a handful of minor changes marked the ’95 models, including long-life automatic-transmission fluid. Larger, foldaway style mirrors were installed, and radios got bigger controls. Sedans wore new bodyside moldings, while Estate wagons added a shade for the “vista roof” as well as a cargo cover. 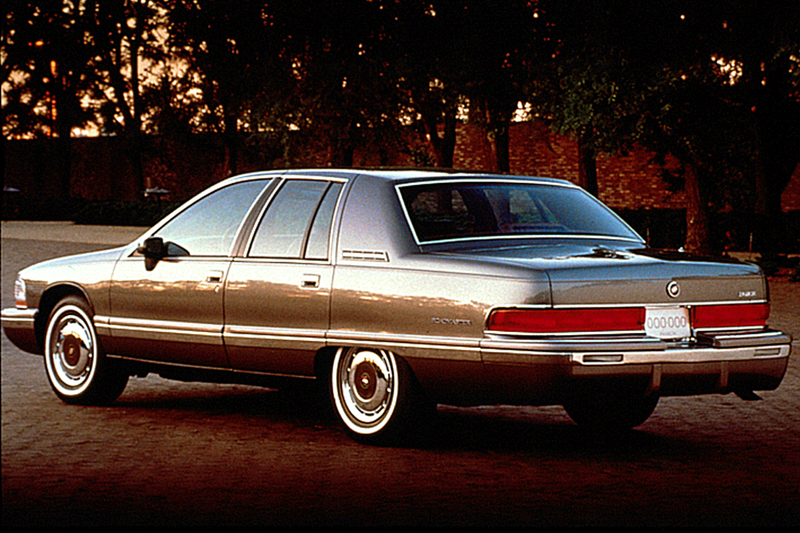 For its final season, the traditional-size, rear-drive Roadmaster enjoyed only a few changes. 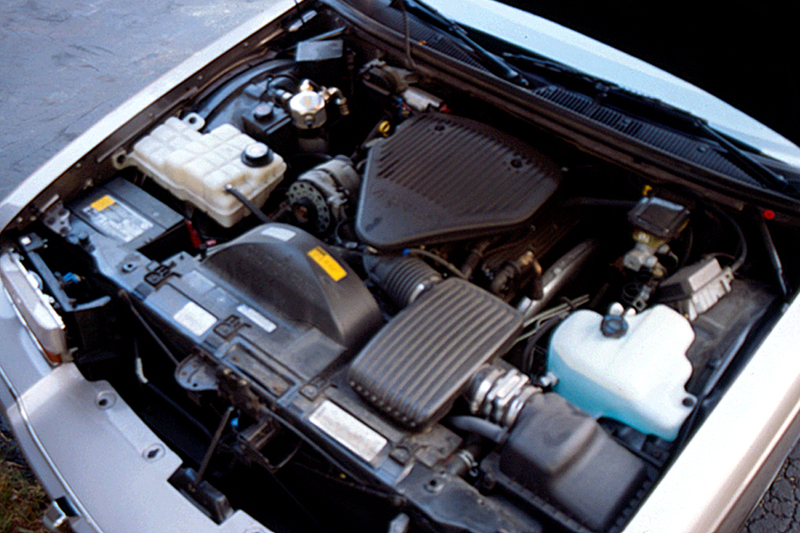 Engine coolant could last 5 years or 100,000 miles, and automatic climate control became standard. Roadmaster wagons started off with a single engine: a Chevrolet-built 5.0-liter V8 with single-point fuel injection, making 170 horsepower, connected to a 4-speed overdrive automatic transmission. A 5.7-liter V8 arrived along with the sedan, rated at 180 horsepower and yielding considerably more torque than the 5.0-liter. The Corvette-based LT1 engine installed in 1994 Roadmasters made 260 horsepower and 335 pound-feet of torque. Although the block was the same as that used under prior Roadmaster hoods, most internal parts were new. The LT1 engine had one fuel injector for each cylinder, plus a stainless-steel dual exhaust system. A new electronic 4-speed automatic also entered Roadmasters for ’94. More stable than its predecessors, with a firmer suspension than Chevrolet’s structurally similar Caprice, the Roadmaster offers capable highway handling for a car of this class. 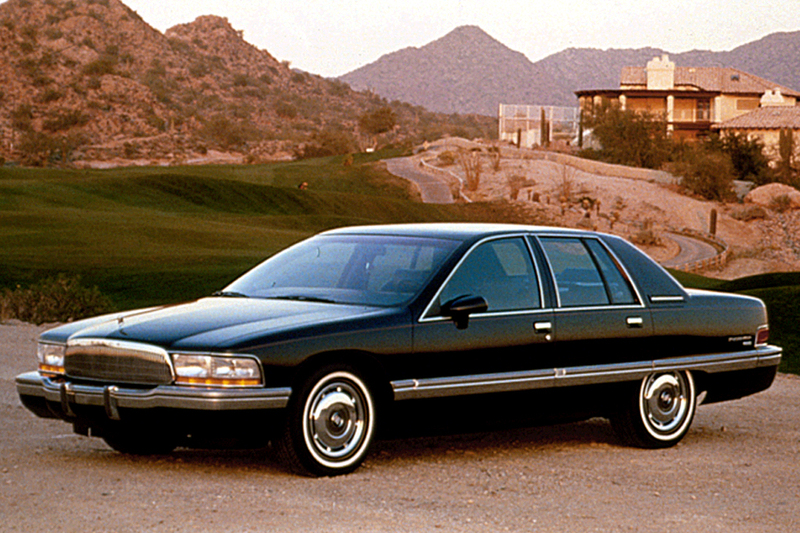 The ride is smooth and steady, with less bounce over bumps and sway in the corners than a Caprice suffers. The big wagon feels stable and is easy enough to control at high speed. Steering is more accurate and the ride more controlled than a Caprice’s. Even so, the generously sized sedan and wagon tend to bound and float over wavy surfaces. Antilock braking works well, with good control. Acceleration with the initial 5.0-liter V8 is good. Snappier yet, especially when passing or merging, is the 5.7-liter V8 that became standard for 1992. Hottest of all: the Corvette-based 260-horsepower V8 tucked into 1994-96 models. Those Roadmasters also contain dual airbags, rather than a driver-only airbag as in earlier models. Gas mileage is barely passable in town, but surprisingly good on the road. We averaged 24 mpg on a highway trip in a Limited sedan with the 180-horsepower engine, but mileage dropped below 16 mpg in city driving. Six fit easily in a sedan, and the wagon’s rear-facing third seat holds two youngsters. The fixed-glass “vista roof” manages to brighten the wagon’s interior. A roomy Roadmaster with Trailer-Towing Package can haul 5000 pounds. In addition to a large cargo area, the wagon has numerous storage bins and pockets. Sedans offer a huge trunk, but rearward visibility is marred by thick roof pillars. Controls are straightforward. Full analog gauges, including a tachometer, are better than Caprice’s. Nine large climate-control buttons may be reached by the driver or front passenger. Description: Secondary hood-latch assembly can corrode, causing high latch release effort and possibly preventing hood from latching properly. Description: Shoulder-belt guide loop plastic covering may crack and expose steel subplate; seatbelt webbing could be cut in a crash. Description: Antilock brake system modulator can corrode and leak fluid; can reduce brake effectiveness and increase stopping distance. Description: Oil cooler inlet hose may be too close to steering gear, causing chafing; could result in oil leakage and fire. Description: On a few cars, paint between wheel and brake rotor/drum can cause lug nut to loosen. Description: Fuel-tank fasteners can detach, eventually allowing tank to sag and strike roadway. Description: At low temperatures, throttle return spring could fail, and engine speed may not return to idle. Description: Lower ball joint on a few cars sent to Guam and Puerto Rico can separate. Description: Improperly adjusted transmission linkage may permit shifting from “park” position with ignition key removed. Description: Airbag caution label and roof-rack caution label were incorrectly installed on same side of sunvisor. Description: Wheel lug nuts were not tightened to the proper specification. This could result in wheel loss.